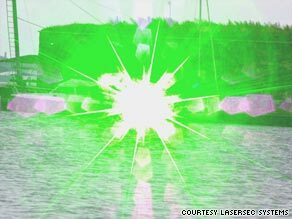 LONDON, England -- A military-grade laser that blinds temporarily is the latest security technology available to wealthy superyacht owners afraid of pirate attacks. The SeaLase laser temporarily blinds pirates -- preventing them from attacking the yacht. The "SeaLase" laser, similar to weapons used for crowd control in Iraq and Afghanistan by the U.S. military, has a range of four kilometers and becomes harder to look at the closer an attacker comes. At a distance of one kilometer, attackers develop strong nausea and can no longer see, according to Lasersec Systems, the Finnish company that developed the lasers for commercial use. "We don't have guns, so we need non-lethal systems to defend yachts," Lasersec CEO Scott Buchter told CNN. Buchter, who recently launched the $104,000 multi-colored laser at Monaco Yacht Show, says the loss of eyesight the laser inflicts is only temporary and that no permanent damage is inflicted. Hi-tech military-grade security systems like SeaLase have become increasingly popular with superyacht owners looking to protect multi-millon dollar yachts on the open seas. Pirate attacks on oil tankers and other boats in dangerous waters like the Gulf of Aden off the coast of Somalia -- a maritime link between Europe and Asia --have fueled the growing worry that superyachts may be the next target. Because law regarding the use of deadly force on ships is ambiguous in some countries and the transport of guns is illegal in most international waters -- yacht crews favor the use of non-lethal weapons for security. This has fueled the recent market boom for weapons like SeaLase, according to Buchter. SeaLase is the latest of these kinds of weapons, which include "L-Rad," a long-range acoustic device that temporarily deafens enemies and the $450,000 "SeaOwl" tracking system, which combines radar and infrared or thermal cameras to detect incoming threats as far as five kilometers away. BAE Systems, the world's second largest global defense company, is thinking even bigger with plans for a sophisticated electronic early warning system for supertankers that some experts say could cost several million dollars. "Piracy is on the rise," said Nick Stoppard of BAE systems. "Attacks in 2008 were double those of the previous year and there is a clear need for better methods to help commercial ships identify and evade pirates before an attack occurs." The early warning system would use extremely advanced radars that could see over the horizon, as far as 25 km away. But pirates are not the only enemies of affluent yacht owners. For some, the paparazzi, using long range lens to take pictures of them on their yachts, can pose a privacy headache. According to reports in UK newspaper, The Times, Russian billionaire Roman Abramovich has installed an "anti-pap system" that would fire light beams at a camera, disrupting its ability to take images. Aside from the anti-pap system, it has been widely reported that Abramovitch's yacht "Eclipse" carries an anti-missile defense system and an escape submarine. The yacht is also said to have doubled in price to $1.2 billion since its commissioning three years ago. Michael Howorth, former super-yacht captain and technical editor at SuperYachtWorld magazine, told CNN for a previous article: As a yacht owner, "you would be an absolute fool if you didn't have this sort of advanced defense technology.